Sorry to be late to the party, an email from here went to Spam, and I just noticed it. Also, it's past my bedtime, so I haven't watched the full video or read most of the comments, so hopefully I'm no re-hashing things everyone else has already said. 1. I love the ship, I don't like the Title on the ship. I think the Title & the Arcen Logo should be on the same 'layer' as the buttons. 2. The buttons feel very AIWC, which is not a bad thing, but also a little bland. Are they too big for the text they're conveying? Maybe rather than at the bottom they run on the left hand side? 3. Release notes : someone mentioned this, and I briefly glanced at it, so I'll comment : I liked how AIWC had a scrolling release note thing (IIRC). It felt like the game was talking to you, and I think it was engaging. 4. A game with great UI I want to highlight is Endless Legend. There's a plethora of menus, but navigating and understanding them is a pretty quick & easy process. Hopefully I'm not too late to the party, and not speaking into the void, but wanted to add what I could! Endless Legend has a pretty UI. When you're talking about usability they did a lot of mistakes, most of which they ignore. It's unique in that they've crippled some playestyles with UI, e.g. using stockpiles is a pain so you'd better not include them in your strategy. No worries stryder2384! We are still listening. We'll lock a thread when we have moved on to something else. Thanks for the feedback. If you don't have time to go through the entire video (some of them are pretty long), I have tried to include a summary of the questions Chris asked. As far as the Endless series, I have heard a lot of people recommending their UI over the years. I haven't spent a lot of time with their games other than Dungeon of the Endless. 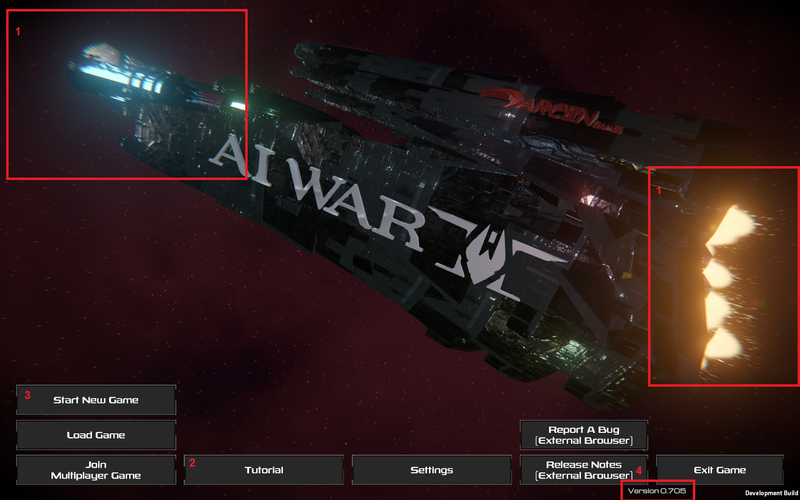 What are some of the particular things they did with their UI that you think would be useful in AI War 2? I get what ilitarist is saying about them ignoring their mistakes: I was playing Endless Space 2 the other day and was frustrated in managing the different species and setting my planet-tier bonuses. These options are in a menu screen that can only be accessed by going to an entirely different menu screen. (I think the species management is accessed by going to the political screen and then clicking on the population survey, as an example.) Ironically, both of these management systems involve using your luxury resources stockpiles... the same stockpiles ilitarist was mentioning were a pain to manage in Endless Legend. Take our quick poll and give us your feedback on the Main Menu! Helping organize things for AI War 2. I'm not the one you asked but I can tell you what I think is good about EL/ES UI: presentation through fonts and layout. It looks like an Apple customer site or something. You can probably see that even when it's inconvinient in ES2 you still got nice font and spacing. 2. I like the location of the menu, but agree with Kordy that it seems like they are just filled excel cells at the moment. in AIWC you made a point to have them be various shapes and I think that would go a long way in to off setting that current feeling. 3. Like etheric42, I went into the join multiplayer to see if I could create my game from there, because the text for the "Start New game" just isn't clear enough that it is for both Single Player and Multiplayer. While the text from AIWC "Host New Campaign (1-8 Players)" worked, it was unfortunately very wordy, however, it at least let us know that it was the multiplayer interface as well. 4. A few others have mentioned it but the Version really seems out of place at the moment just kinda 'put' there. It would look best if in one of the corners. The top right is currently completely void, so it could be put up there and do okay. Including the date for the patch note as well so people know when there has been changes. So I answered the questionaire in a way I felt was sort of satisfying, but I felt I didn't get to say enough about what I want. I really do like the idea of nested buttons, as in you click on a single option and multiple choices float out for you to select from. "Play Game", "Multiplayer", "More Options" and "Exit Game" should be the four primary buttons, and in Play Game, you get "Quick Play", "New Game", "Continue" and "Load Save". In Multiplayer, you'd get "Find Game", "Host Game" and "Load Game". In More Options you'd find "Game Options", "Patch Notes", "Credits" and whatever else doesn't fit into the Play Game and Multiplayer categories. Finally, when selecting Exit Game, you exit the game. Or get a confirmation box "do you wish to leave so soon?". Also that confirmation box should be an optional setting in the Game Options menu. I also voted that I think the buttons should all be sorted up along the right hand side of the menu. The reasoning for this is because I believe you'll spend most of your time looking at the right hand side of the screen while in-game, so it would be nice to keep things consistent. "This is where all the important stuff always is, keep it in mind from the beginning." I am not a huge fan of the current look of the main menu. I think the title should definitely be separate from the "background" (the moving ship). No harm having it on the ship as well, but right now the title screen lacks the title. The button layout works, I prefer vertical menus but it really doesn't matter too much so long as they are well ordered and don't interfere with the background. I think expanding menus would be good if there are too many buttons though - multiple rows of buttons would be too much. This is a bit off-topic, but I'd like to intrude in the discussion about what is so good about the UI from the Endless games. It is not a single big thing, but a lot of details that add up better than most 4X games. First, of course, the games are gorgeous in general and the UI just plain looks good. This makes a lot of difference. A big part is that it is generally very easy to navigate (with exceptions). You click on stuff and it just takes you to the appropriate screen - click a hero to manage him, click on a tech to go to the tech screen, a quest location to go there in the map, a unit to go to unit designer, etc. Right click closes any screen, no need to click on a close button. Menus and lists are often collapsable to save space or see a bigger list or whatever. Just mouseover anything and it will generally show you what you need to know in a nicely formated tooltip - no need for a dedicated screen or an in-game encyclopedia or an online wiki. (But when the tooltip does not tell you enough, you are generally screwed - making it somewhat hard to teach the more convoluted mechanics). You can also interact with stuff from various places - you can assign a hero to a city from the hero screen, the city screen, the system/city list. This list is also awesome - most 4X games have one, where it lists the yelds of each colony and what it is producing and etc. But in the Endless games, you can switch the production from here, assign heroes, change population from one planet to the other, or click on a system to just go there and see more details. It also conveys information in a very visual way. It uses plenty of symbols, color-codes everything, uses boxes and cards to format "tooltips" when you mouseover, have visual effects for most things happening, etc. It has all the quality of life features most recent games have: neat alerts every turn in the side of the screen, zoom out abstracts the maps, good sound effects, diplomacy shows you what the opposing AI will accept, etc. I never before heard someone say the UI was inconvenient, quite the opposite - with Endless Space 2, people said it was super convenient but hard to learn. I myself often find it hard to go back to other 4X games after playing Endless Legend for example, it is just annoying. It has some glaring fails: systems like stockpiles or minor factions are hard to figure out, some screens are bad (like quests in Endless Legend or politics in Endless Space 2)... but people still like it much better than Civilization 6 or Galactic Civilizations 3 or even Stellaris - and in 4X, the bar is quite low (Distant Worlds, Aurora 4X, Master of Orion 2). AI War Classic is generally on the bad side but has some cool features. Now, as far as how this is all applicable to AI War 2, I'd say it isn't easy to just translate as the games are very different. Maybe try to use somewhat similar layouts for tooltips and other stuff? The main menu isn't a particularly strong point in the Endless games. My only cautionary tale addition to the comparison of ES2 or EL and AIW2 is that how you convey information in a Turn Based 4X and an RTS 4X should be quiet different. Yes we "can" pause in AIW2, but you aren't meant to play the game in "Paused Mode" setup all your actions, and then un-pause for a few moments to let those actions take place. Similar to how some would play CK2, EU4 or HoI4, the game is meant to run normally, and you pause when you need to investigate something specific. For example you've done scouting on several systems and want to see which will be the best targets of opportunity. When you are looking at things from an RTS standpoint, it is very important that you can quickly evaluate your overall sitrep with a few glances. Lots of really good points. I've always seen AIW as borrowing from both the 4X and RTS genres. I think there is a lot influences that can be synthesized. In the parts of the game that are slow/paused like campaign setup I tend to look at 4X influences (after all, how many options do you really get in an RTS when you set up a match?) whereas in the thick of things you need streamlined controls from RTSs (except ones that can manage hundreds of units instead of dozens, and dozens of classes instead of a handful). I couldn't remember the last game I played with a horizontal menu but then I checked a few games and was surprised to find XCOM 2 with one! If it's good enough for Firaxis then it's good! As long as the menu is symmetrical I don't think I care. I played XCOM 2 really recently and couldn't even remember it had a horizontal menu! I think putting your logos on a ship is funky and cool but also feels slightly less ..... serious ... (if that's the right word?) then having a big "AI WAR 2" title at the top. I'm not too fussed either way, but the words definitely need to be more prominent and attention grabbing. TLDR: I will spend less than 0.1% of my time on the main menu screen. Make it functional at least and move on. Interesting note: Borderlands 2 and Sleeping Dogs don't even have logos on their main menu at all! I never noticed that before. Here's an update as to the direction we are looking for the main menu. The first time you open the game, it goes to profile rv 5 newedit.png. When you launch the game in the future it remembers what your profile is and just goes to main menu rv 5.png (but you will only see the bottom row of buttons. The buttons above them only pop up when you click or hover over the bottom button, not sure which between clicking or hovering though). If you change your profile in the future it goes to profile rv 5.png OR profile rv 6.png, not sure which of those is preferable. I'd appreciate some feedback, particularly in whether click or hover should expand the menu and which profile change revision is preferable. Regarding Hover vs Click, I am definitely on team Click. Hovering is nice and quick, but it also can be super frustrating at times. Imagine if you will hovering over the Multiplayer button to join a new game with a friend, but because you didn't stay perfectly aligned up and down when scrolling you fell off the menu's edge and the menu collapsed on you. Or depending on how sensitive the box for making the hover show up is, when you start moving the mouse point up from "More" to "Wiki" the menu vanishes because your pointer spend just a little too long in the white space between buttons. Yes, I am definitely a click supporter, have the player make the conscious choice that "yes I do in fact want to look at the Single Player sub-menu". They will need to 'click' regardless for the sub-menu button and the "Exit Game"/'Settings" buttons so i say be consistent throughout them all. Will we see our First Officer's picture within the game at all (or very much) aka do we 'care' what/who our FO is? if so I think rv5 fits better than rv6. If not then rv6 as it is cleaner and quicker. I had some question about profile rv6. 2. Is the intention that when you click the 'change profile' button it would bring up the small menu to the right and then you can select / edit from there? 3. Would the edit profile bring you back to a screen similar to rv5 newedit only with your current ark and FOPortrait already selected as opposed to empty which would be on the new version of the screen? 4. I don't recall, but I think there was talk to the various arks being more than just cosmetically different. Is that the case still? Does the same apply to the First Officer? 5. By Starfield, do you just mean the background galaxy art that plays during the main menu or is this something different? 7. Should we need to say Multiplayer in all the multiplayer sub-menu boxes? again in the interest of saving text space, would it make sense to shorten them to "Join Game", "Host Saved Game", and "Host New Game" since they are all under the multiplayer section to start, and really none of them use the same language as the Single player sub-menus. 8. Lastly, the Credits, personally I think these should be an in game thing. Have the galaxy flowing in the background, music playing, and having people enjoy the credits scroll by. As opposed to going to a website that will just list everything out. It does take more time to do it that way though, so I could understand this being one of those "if we have time" items. Words of caution... if the idea of having player profile names appear on the ship is on the table two things to consider. 2) Be prepared for inappropriate / silly ship names to appear on the internet. e.g. Shippy-McShipface because well.. internet's gotta internet, heh. Definitely click to expand menus instead of hovering to expand menus.